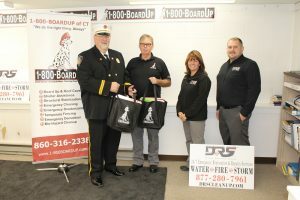 (PORTLAND, Conn. Nov. 8, 2017) – Disaster Restoration Services (DRS), a member company of DKI, North America’s largest disaster restoration contracting organization, teamed up with 1-800-BOARDUP of CT to donate smoke and carbon monoxide detectors to the East Granby Fire Department, which had partnered with Domino’s Pizza to promote the importance of working smoke alarms. 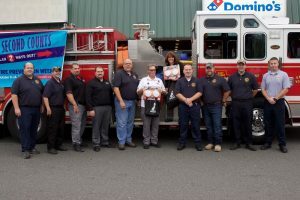 In response to National Fire Prevention Week last month, October 8 through 13, Dominos held a promotion on November 3 to surprise those customers who placed a pizza order with a delivery from East Granby Fire Department, who then asked to check the customers’ smoke alarms throughout their homes. If the customer had a working smoke alarm, their pizza was complimentary. If not, however, the firefighters would install a new, fully functional one, donated by DRS and 1-800-Boardup of CT.
“A smoke alarm is critical for the early detection of a fire in your home and could mean the difference between life and death. Fires can occur in a variety of ways and in any room of your home. But, no matter where or how, having a smoke alarm is the first key step toward your family’s safety,” said DRS President Danny Strong. DRS is a family-owned company dedicated to helping Connecticut and Massachusetts residents and businesses get their homes and properties back to pre-disaster condition. The DRS team of restoration experts are on call every day, 24/7, so when disaster hits, we are there to recover the damage. For more information, visit www.drscleanup.com. 1-800-BOARDUP of CT is a division of DRS, specializing in emergency response services for disasters. With under an hour response time, properly equipped and trained crew members, and a crew who will do the right thing always, contact them at 1-800-BOARDUP or 1-800-262-7387 if you are in need of emergency board-up services.